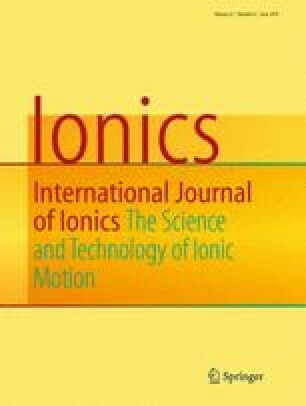 In the current research, iron oxide nanoparticles were functionalized by acrylic acid polymerization. The Fe3O4/PAA core-shell nanoparticles were utilized for the modification of cation exchange membranes. Ion exchange membranes were prepared by solution casting technique using cation exchange resin powder as functional group agent and tetrahydrofuran as solvent. FTIR analysis proved the formation of PAA on nanoparticles. The SOM images also showed uniform particle distribution for the prepared membrane relatively. The membrane water content was declined from 30 to 17 % by increase of nanoparticle content ratio in membrane matrix. The contact angle measurements showed that membrane surface hydrophilicity was improved by utilizing of nanoparticles in the membrane matrix. The membrane potential, permselectivity, and transport number were improved initially by increase of nanoparticle concentration in the casting solution and then began to decrease by more additive concentration. Membrane ionic flux and permeability were enhanced initially by increase of nanoparticle loading ratio up to 0.5 %wt in membrane matrix and then showed decreasing trend by more increase of nanoparticle concentration from 0.5 to 4 %wt. Membrane areal electrical resistance was decreased sharply by utilization of nanoparticles up to 0.5 %wt in membrane matrix then began to increase by more additive concentration. The prepared membranes exhibited superior selectivity and low ionic flux at neutral condition compared to other acidic and alkaline environments. The authors gratefully acknowledge Arak University for the financial support during this research.